You need an attorney who will fight for you. David Glenn of The Glenn Law Firm is Board Certified in Personal Injury Trial Law and has been fighting car accident injury cases for 30 years. If you have been involved in a car accident, regardless of who was perceived to be at fault, you need an experienced attorney who can piece together the details and form an appropriate strategy. The experienced, dedicated attorneys at the Glenn Law Firm have experience dealing with every kind of auto accident. Rear-End Collisions occur as the result of one car colliding with the car in front of it. These types of accidents can be caused by sudden braking or deceleration by the car in front or when the car following is traveling faster than the one in front of it. Under most circumstances, the driver that rear-ends the other car will be found at fault for the accident owing to following too close or by reason of driver distractions such as texting, cell phone conversations or even just tuning the radio. No matter what the contributing factors may be, the expert attorneys at the Glenn Law Firm will thoroughly investigate the accident down to the smallest detail. If you have been the victim of a rear-end collision then you may be entitled to damages resulting from the accident or any resultant injury. The Glenn Law Firm has seasoned attorneys that will do a thorough job hear your side, determine the scope of the accident and deserved damages and get you a settlement that is reasonable and fair. Insurance companies don’t always offer the best settlements. You need an attorney who can work with the insurance company to get you a fair and reasonable settlement. The Glenn Law Firm is your best mediator between yourself and the insurance company. Side-Impact Collisions (aka “T-Bone” or “broadside” collisions) are the result of a vehicle sustaining side-impact damage inflicted by the front or rear of another vehicle or by a fixed object. The Glenn Law Firm will investigate your side-impact collision accident, fully reconstruct the details factoring in all of the circumstances that led to the accident and advocate for a settlement that accounts for damages to your vehicle as well as any personal injury that may have resulted from the crash. Sideswipe Collisions occur when the parallel sides of two cars impact or “swipe” each-other. If both vehicles are traveling in the same direction and at comparable speeds, it is likely that damage will only be cosmetic. The Glenn Law Firm will determine who was at fault, why the accident happened and reach a reasonable settlement based on the extent of the damage and any resultant injury, should any occur. Rollover Accidents happen when a vehicle flips over on its side or onto its roof. Rollovers are frequently caused by taking a sharp turn at too high a speed. This type of accident is more common to vehicles with high center-of-gravity ratios like sport utility vehicles but any car can be at risk of a rollover under various circumstances. If you have been involved in a rollover accident, the Glenn Law Firm will investigate it and determine where the fault for the accident lies. Not all rollover accidents are the result of driver negligence and the Glenn Law Firm will fight aggressively to win you a settlement should outside factors play any role in the accident occurring. Head-On Collisions are the result of the front ends of two vehicles colliding with each other. Head-on collisions often result in fatalities and often create a clear picture of which driver was at fault. Most head-on collisions are the result of one car crossing a diving line or median and striking a car in an oncoming lane. The Glenn Law Firm is committed to aggressively pursuing drivers who cause head-on collisions and will make sure that surviving victims receive compensation for their injuries as well as any medical treatments or debts incurred as a result of the accident. Single-Car Accidents are often the result of operator negligence but drivers should never rely on the details of a police report or insurance company’s statement as a determinant of fault. Call the Glenn Law Firm and speak to an attorney for free to determine if any mitigating factors might have resulted in the accident occurring. Multi-Vehicle Pileups involve many vehicles, often in a “chain reaction” due to heavy traffic, poor visibility or other factors. Vehicles in multi-vehicle pileups can be struck repeatedly adding to the risk of injury or death and the causes can be difficult to determine. At the Glenn Law Firm, experienced attorneys will dissect every detail of the accident, determine fault and go after everything that is fair to properly compensate you for damages or injuries resulting from a multi-vehicle pileup. Looking for a Dallas Car Accident Attorney that has the experience AND is willing to take your case all the way to trial, and jury verdict if necessary? Then call The Glenn Law Firm today. 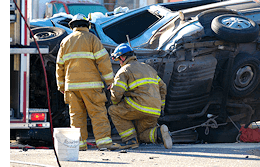 Fatal Car Accidents If you have lost a loved one in a fatal car accident, legal matters may be far from your mind. We understand. When you contact the Glenn Law Firm about your case, we will handle all of the legal details and immediately begin the investigation. Attorney David Glenn has more than 30 years of experience handling personal injury and wrongful death claims for clients throughout Dallas-Fort Worth, across Texas and nationwide. He can provide you with strong legal advocacy and compassionate guidance you need at this difficult time. Call us today at 817-424-5999 to arrange a consultation with a knowledgeable Dallas-Fort Worth fatal car accident lawyer. If your loved one died in a car accident, we are here to help you explore your legal options. Call us today at 817-424-5999 or contact us online to arrange a free consultation with an experienced Dallas-Fort Worth fatal car accident lawyer.